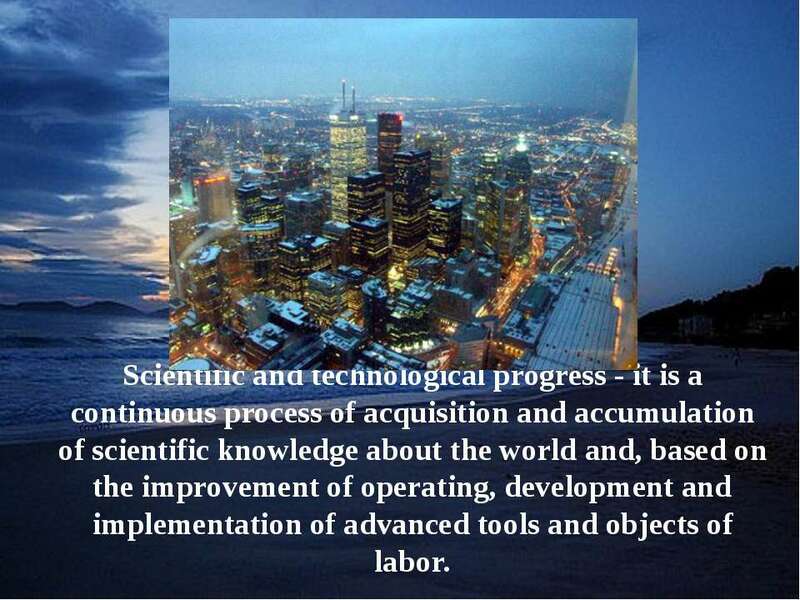 Scientific and technological progress - it is a continuous process of acquisition and accumulation of scientific knowledge about the world and, based on the improvement of operating, development and implementation of advanced tools and objects of labor. Currently, technological progress is moving forward at a fast pace. 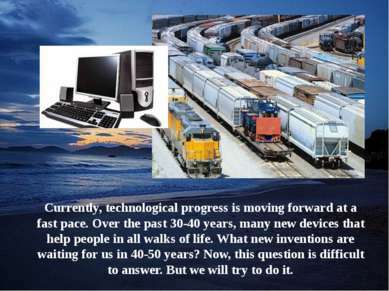 Over the past 30-40 years, many new devices that help people in all walks of life. 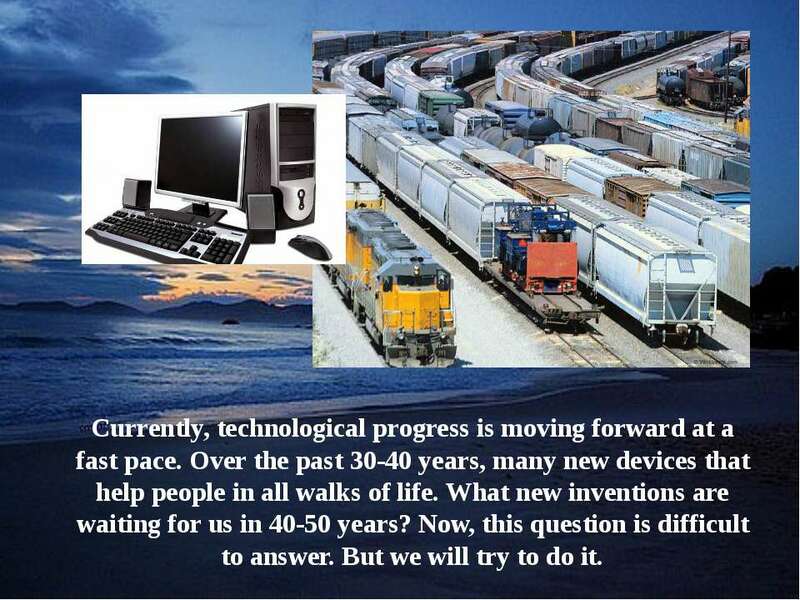 What new inventions are waiting for us in 40-50 years? Now, this question is difficult to answer. But we will try to do it. 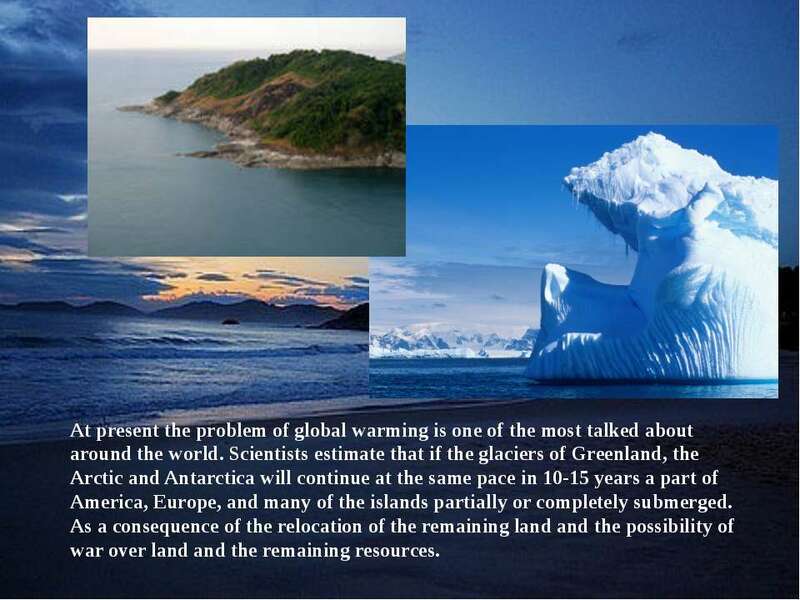 At present the problem of global warming is one of the most talked about around the world. Scientists estimate that if the glaciers of Greenland, the Arctic and Antarctica will continue at the same pace in 10-15 years a part of America, Europe, and many of the islands partially or completely submerged. As a consequence of the relocation of the remaining land and the possibility of war over land and the remaining resources. One solution to this problem may be the idea of a floating house. These self-contained small town or settlement may be in the vicinity of the land itself. 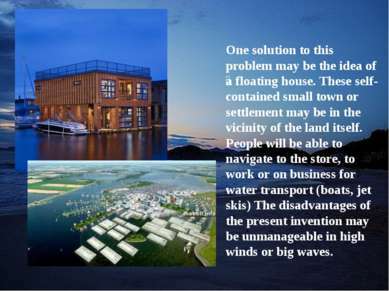 People will be able to navigate to the store, to work or on business for water transport (boats, jet skis) The disadvantages of the present invention may be unmanageable in high winds or big waves. 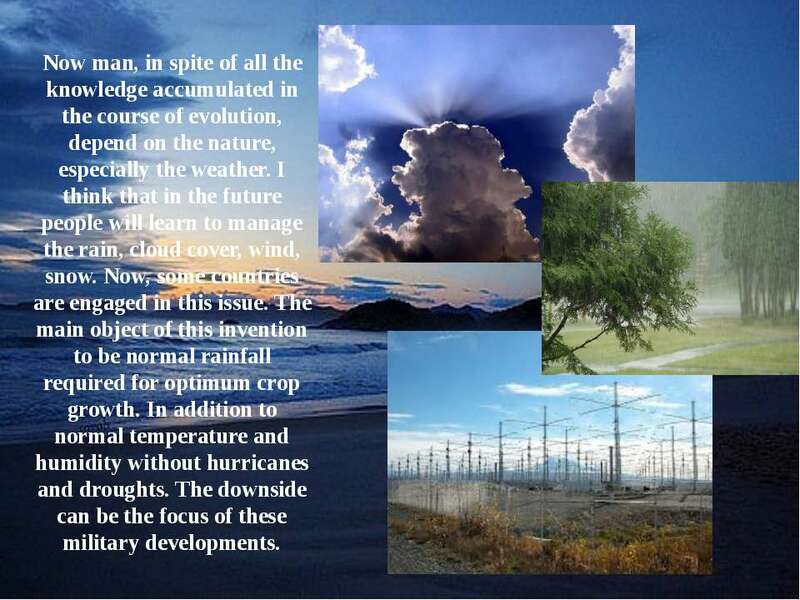 Now man, in spite of all the knowledge accumulated in the course of evolution, depend on the nature, especially the weather. I think that in the future people will learn to manage the rain, cloud cover, wind, snow. Now, some countries are engaged in this issue. The main object of this invention to be normal rainfall required for optimum crop growth. In addition to normal temperature and humidity without hurricanes and droughts. The downside can be the focus of these military developments. 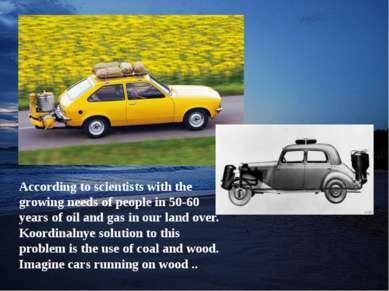 According to scientists with the growing needs of people in 50-60 years of oil and gas in our land over. 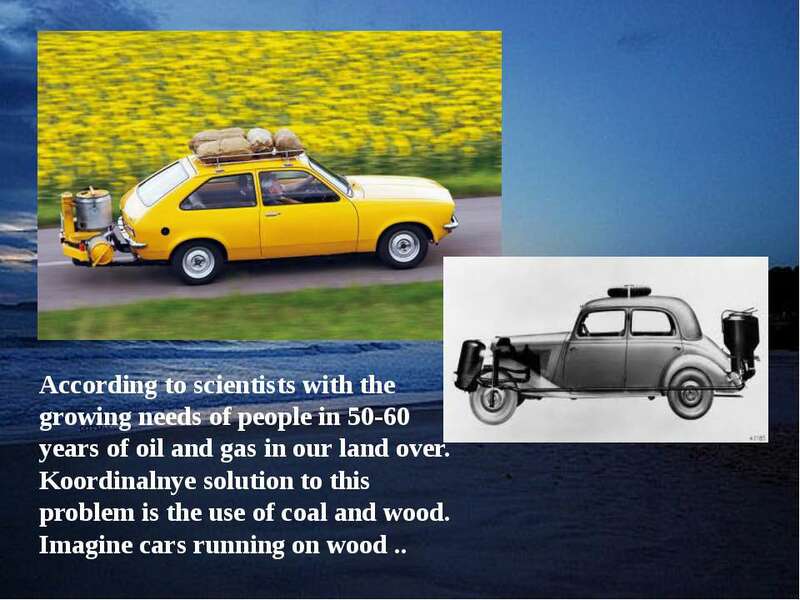 Koordinalnye solution to this problem is the use of coal and wood. Imagine cars running on wood ..
Of course this is a joke. It seems to us that a possible alternative fuel hydrocarbons may be water. The water molecules are composed of two hydrogen atoms and one oxygen atom. Hydrogen and oxygen are flammable, able to give energy when burned. 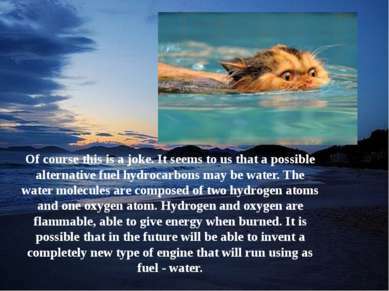 It is possible that in the future will be able to invent a completely new type of engine that will run using as fuel - water. Global problem is garbage polluting the environment. 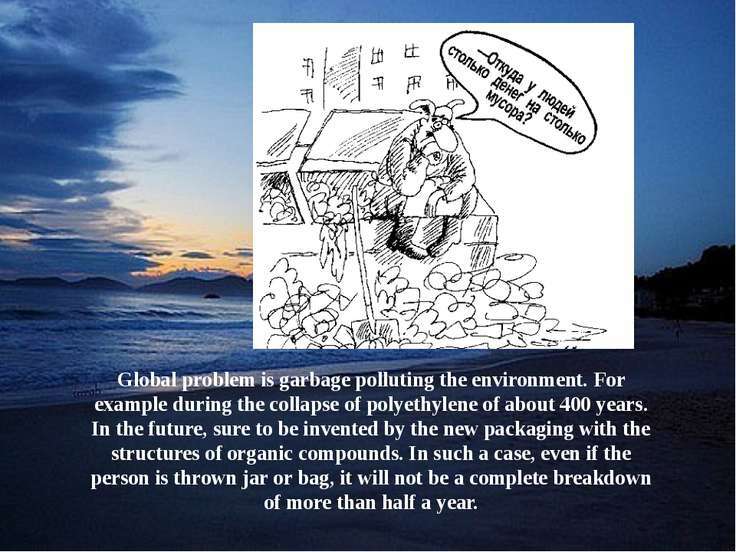 For example during the collapse of polyethylene of about 400 years. In the future, sure to be invented by the new packaging with the structures of organic compounds. In such a case, even if the person is thrown jar or bag, it will not be a complete breakdown of more than half a year. Now in the early 21st century, a person using a computer and the Internet have access to all the world's information. And if you're in the way, but your computer's battery is dead, or if you do not have a computer? 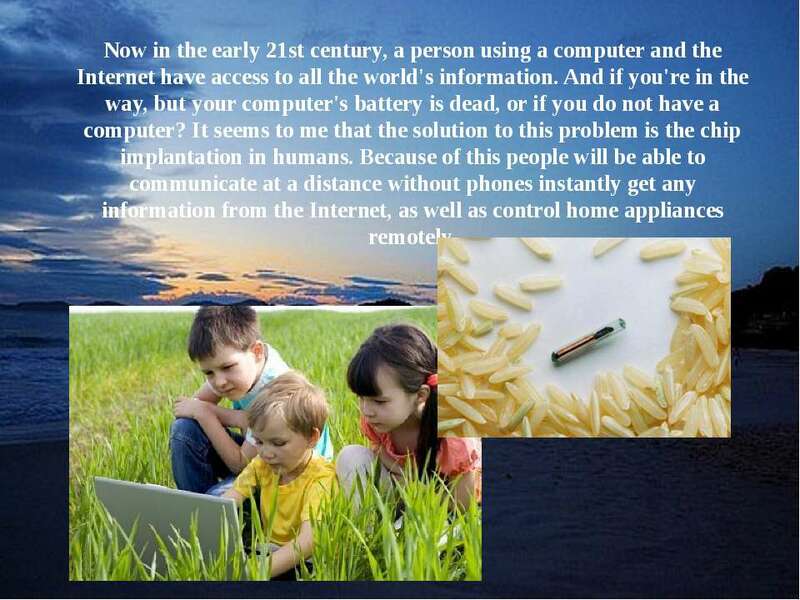 It seems to me that the solution to this problem is the chip implantation in humans. Because of this people will be able to communicate at a distance without phones instantly get any information from the Internet, as well as control home appliances remotely. 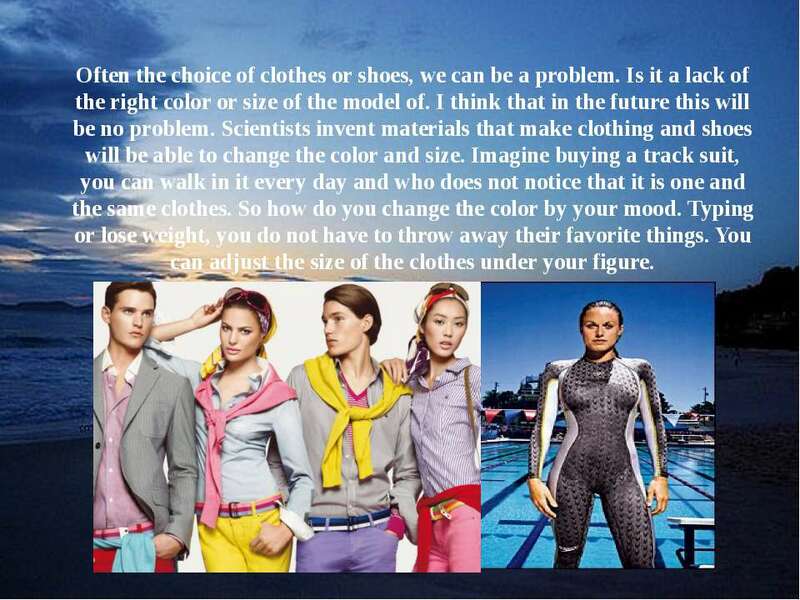 Often the choice of clothes or shoes, we can be a problem. Is it a lack of the right color or size of the model of. 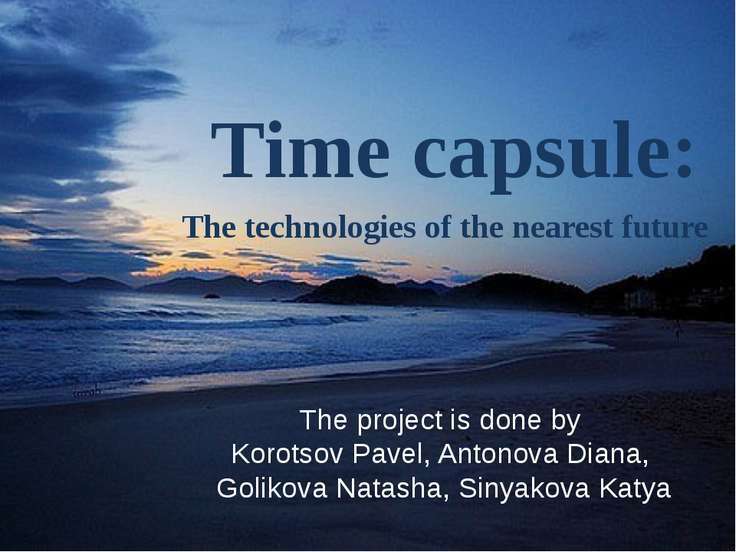 I think that in the future this will be no problem. 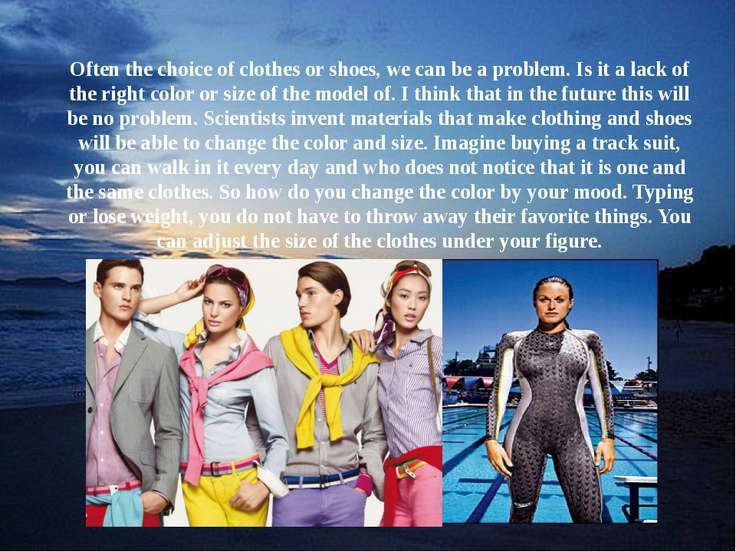 Scientists invent materials that make clothing and shoes will be able to change the color and size. Imagine buying a track suit, you can walk in it every day and who does not notice that it is one and the same clothes. So how do you change the color by your mood. Typing or lose weight, you do not have to throw away their favorite things. You can adjust the size of the clothes under your figure. Water transport is one of the safest. It's not a secret. One major drawback is its not great speed. 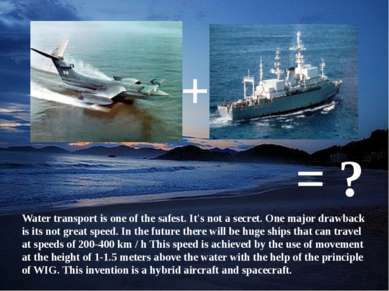 In the future there will be huge ships that can travel at speeds of 200-400 km / h This speed is achieved by the use of movement at the height of 1-1.5 meters above the water with the help of the principle of WIG. 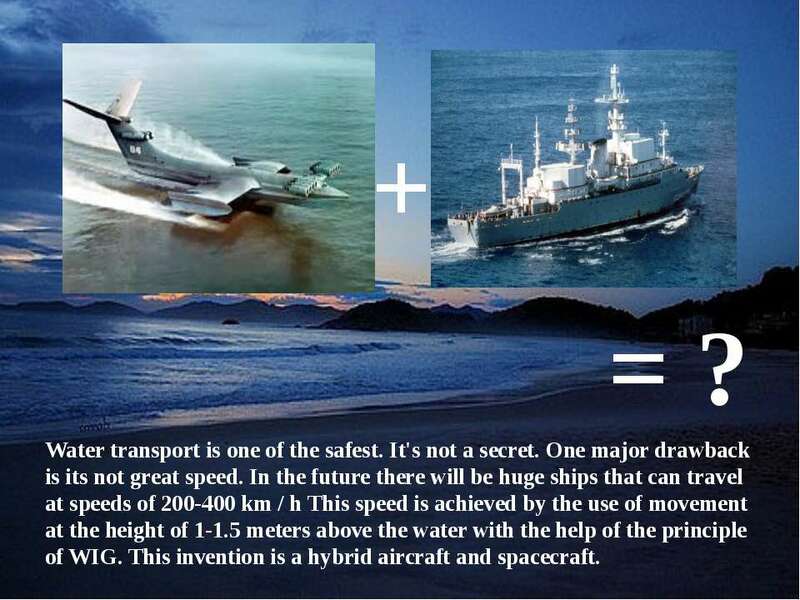 This invention is a hybrid aircraft and spacecraft. + = ? Science and technology dynamic pace continues its path forward without stopping for a minute. We can only imagine how our world will change in the future due to chips, floating homes, new engines. 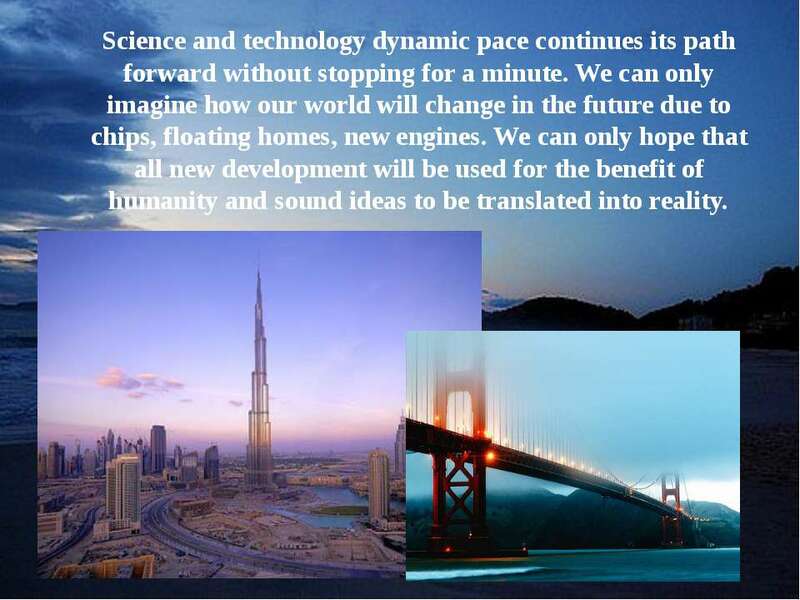 We can only hope that all new development will be used for the benefit of humanity and sound ideas to be translated into reality.